Article with head line Google Nexus 5 user manual, review (video) and Nexus Apps in here aims to help Google Nexus 5 users to be able to use Google Nexus 5 user manual better. Because we think with Google Nexus 5 user manual and review (video) you can learn your Google Nexus 5 with more easy. This article also has Nexus Apps, So you can use Google Nexus 5 more fun. Google Nexus 5 review (video). Google Nexus 5 is fisth smartphone that has technology Android 4.4 (KitKat), delivers an intelligently simple design and showcases a stunning full HD display. Plus it comes in black and white. All-new photo an dvideo features help you capture moment in fresh new ways. And thanks to the Android KitKat, nexus 5 is fast, powerful and truly yours. With Android 4.4 KitKat on Nexus 5 you can enjoy over 1 milion game and apps plus u limited music and custom radio stations from Google Play. And experience it anywhere with 4G/LTE and ultra fast Wi-fi. Android KitKat is smart and simple. becouse android 4.4 lets you personalize everything from widgets to wallpaper. It'a also hands-free with Voice Actions. Just say " Ok, Google" to send a text message, find photos, get directions, and more. it's the best of google, right from your home screen. The Google Nexus 5's screen measure between 4.3 and 4.7 inches often feel slightly cramped. devices with screens that meansure 5.2 to 6.3 inches become cumbersome. Further, the Nexus 5's screen loses the odd aspect ration of the Nexus 4 and jumps to the standard 16:9 ratio. This means it conforms better to HD content. With a resolution of 1920 x 1080 pixels (445 ppi) looks super sharp and it's the highest resolution that currently available on smartphone. When placed side by side with The Nexus 4 1280 x 768 (318 ppi) screen, it looks crisper. And thanks to the addition of the latest iteration of Corning's toughened glass technology, Gorilla Glass 3, it should also be pretty durable too. The location of the ports and buttons remain the same as on the nexus 4 : volume rocker on the left, audio jack at the top, power button on the right, and Micro USB at the bottom. What has changed, is the position of the speaker grill. On the Nexus 4 the grill is located on the rear of the device, but on the Nexus 5 it's at the bottom, which has a slight drawback. While holding the phone in landscape orientation, I sometimes find my hand blocks the audio. OS : Android 4.4 KitKat. Memory : 16GB or 32GB. Camera : 8MP of rear and 1.3MP of front. Processor : Qualcomm Snapdragon 800, 2.26GHz. Made to capture the moments that matter. Capture and share your world like never before. Endless fun in every way. See Google Nexus 5 review specs more clearly (Google Nexus 5). See Google Nexus 5 review features more clearly (Google Nexus 5). See Google Nexus 5 review apps more clearly (Google Nexus 5). Buy Google Nexus 5 16 GB now (Google Nexus 5). Buy Google Nexus 5 32 GB now (Google Nexus 5). 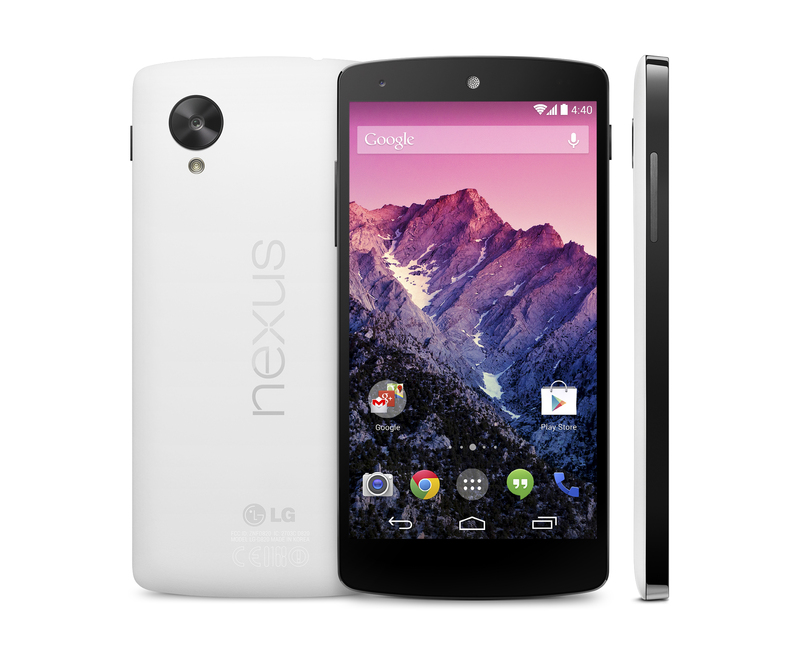 Learn more Google Nexus 5 with download Google Nexus 5 user manual in below. we believe you can use google nexus 5 better after read user manual. You also can download Nexus Apps below to more fun with your Nexus 5. Nexus Clock apps free download. Nexus People apps free download. Nexus Camera & Gallery apps free download. Nexus Google Keep app free download. Nexus Google Earth app free download. Nexus Google Drive app free download. Nexus Google Play app free download. Nexus Gmail app free download. Nexus Google Hangouts app free download.